Presented by MYBA, the Worldwide Yachting Association, the show will take place on May 2-5, 2016 in the historic port town that has launched many a momentous voyage. Native son Christopher Columbus set sail from Genoa on his first expedition in 1492 and the city is rich with nautical tradition and folklore. This background provides an excellent venue to showcase the motor and sailing charter yachts on display for the upcoming Mediterranean summer charter season. Jenny and Nick Trotter will inspect the yachts and meet the crews on behalf of our clients and we will post photos and highlights for yachts of interest in future blogs. For details about specific yachts or to discuss plans for a summer 2016 Mediterranean yacht charter please contact us. 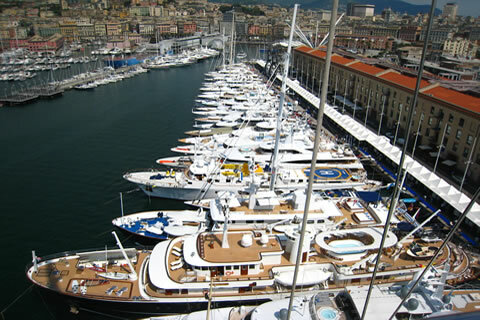 Genoa Charter Yacht Show. Photo taken by Meridian from a mast top. ← The South Pacific beckons….